Our range of beautiful, bespoke Sash Windows is now available across Hampshire, Surrey and Sussex. Sophisticated and Elegant, your new Sash Windows are not only going to look quite frankly stunning, but offer you the best thermal protection available in the country today, meaning you can finally find that balance between beautiful, realistic Sash Windows whilst benefitting from the modern day benefits of Energy A-rated Double Glazed Sash Windows available in Hampshire, Surrey and Sussex. You can get an online quote for Sash Windows by clicking here. Narrow sight lines, elegant sculptured profiles with a host of security features built in and easy clean feature as standard. These stylish Sash Windows can be customised the way you would prefer. Complete your dream Home Improvements with the assistance of Victory Windows, a Specialist Sash Window installer across all of Hampshire, Surrey and Sussex. Change the colour of the window, choose whetehr you wush to have Georgian Bar as well as opting whether to have genuine Sash Window features such as Sash Horns, Tilt Knobs and Pully Cords. All parts you may consider changing to replicate original Sash Windows. With energy efficient reinforcement, all profiles are extruded in accordance with current British Standards and are of a multi chambered construction. Unlike Timber Sliding Sash Windows, our Eco-Sliders not only offer a profile and design incredibly pleasing on the eye as well as the best thermal protection, Energy ratings and U-Values but they're also very high in security. With toughened glass and strong Georgian Bars as standard, this is already a window that won't be getting targeted or broken maliciously any time soon. Our highly trained and qualified fitters will also install your window from the inside and internally bead it. You may also choose to have travel restrictors so the window can't be fully opened by a child whilst most uPVC Sash Windows will also double up as a fire escape which is an essential part of Building Regulations you must adhere too when improving your home. Finished with a Choice of Colours. If a plain white is not quite your thing, our line of brillaitn Woodgrain Finish uPVC Windows give the look of painted timber finish keeping the traditional look and style of timber windows, with all the advantages of uPVC double glazing. What's more, although your new Sash Windows will look incredibly authentic you wont have to worry about painting or maintaining your new Sash Windows, just the odd wipe down with a clean cloth and lukewarm water will be enough to keep your brand new Sash Windows in tip-top condition. With uPVC Sash Windows there's no need to worry about woodworm, rotting, warping, damp or broken pully chords. Sash Windows from Victory are protected against these issues by design. 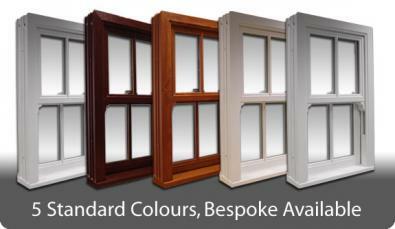 The best thing about our range of stunning Sash Windows is the price. Although prices will depend on the style, size and personalised features we're often told that are our prices are around 40% less than our competitors. There's no Sales Reps, No Gimmicks or Games, just industry leading products at very affordable prices. Put us to the test, click for an online quote, call us today on (023) 92 824 006 or (023) 92 666 955 (out of hours).